First, you need to log into FamilySearch. Next, you fill in the blanks. 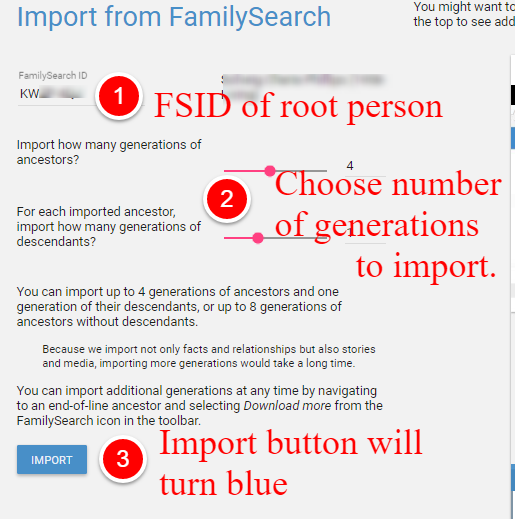 Enter the FamilySearch ID number (FSID) of the root person of this tree. It will default to your FSID, however, you may enter any FSID for a dead person. You may import 4 generations of ancestors and 1 generation of descendants, or 2 generations of ancestors and 2 generations of descendants, or 3 generations of descendants, up to 8 generations of ancestors at a time. 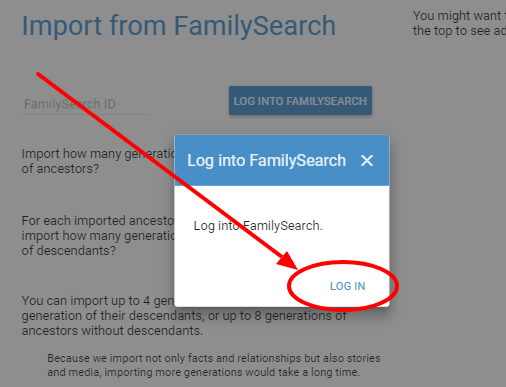 Later, you can import more generations by clicking on an end-of-line person and selecting "Download more generations" from the FamilySearch menu. Click on the now blue "Import" button. You tree will be imported shortly. You will get an email when it is done.